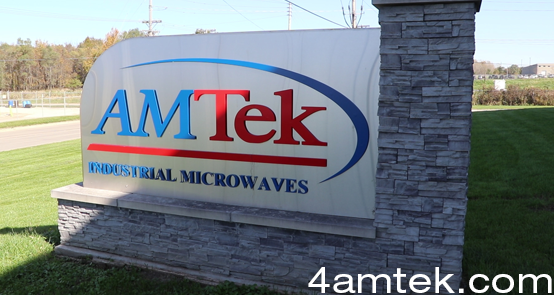 AMTek staff have designed, manufactured, and supported hundreds of industrial microwave systems over the past couple of decades. Our team brings experience in developing microwave equipment for the food industry for cooking and tempering a wide variety of products. The AMTek team has over 75 years of combined industrial microwave experience in manufacturing, engineering design, and service tech support. Our team has designed, manufactured, installed and supported over 220 complete 915/896 MHz microwave processing systems worldwide, as well as over 450 high-powered microwave transmitters designed, manufactured, installed and supported worldwide. AMTek staff has designed and manufactured 2.45 GHz batch ovens for the textile and health care industries and developed and manufactured direct gas-fired impingement modules as part of a combination microwave / impingement cooking systems. The staff at AMTek has vast experience in the development of Allen Bradley PLC-operated microwave processing systems, development of high powered microwave circulators to support this equipment, designing of small tempering systems to support the cruise ship industry and development of product sensing systems to automate the cooking process. AMTek also has experience with the incorporation of CO2 fire suppression systems for microwave cooking equipment. Our staff experience also includes UL listed panel shop certification and CE Certification of microwave systems designed and installed in the UK and mainland Europe. Established AMTek Inc. as a business unit in March 2003. Released the prototype AMTek solid state transmitter design. First AMTek tempering oven system sold to Plymouth Beef in Hunts Point, NY. Patent applied for on the Industrial Pulsing software. Developed the first Cognex vision system for the cooking systems. Purchased the AMTek facility expanding into the entire 25,000 sq.foot building. Started the AMTek cable and controls division. Added US, Australia, Russia, Asia, Southern Asia distribution. Became a key cable supplier to the Wind generator industry. Added Brazil distributor – Fimach. Added the UK, Scandinavia and Europe distributor – Selo. Installed the first Microwave Vessel heating system. Completion of a 15,000 foot addition to the AMTek facility. Added Poland and Mexico Distributors. Released the new horizontal and vertical vessel systems. Designed new Indexing Batch Oven Assembly. Completion of a 15,000 foot office and warehouse addition to the AMTek facility. Celebrated 10 years in business. Added a Chile and Argentina distributor. Released a new mini batch oven at 20kw. Added a distributor in Italy and installed the first unit successfully there. Installed the first precooked bacon oven into Sweden. Added a distributor in South Africa covering 6 African Countries. Added Distribution into Panama, Central America.